Twenty years or so ago I found my first wire jack knife. At that time I wasn't really sure what it was, but I liked it so I bought it for my knife collection. At that time I had mostly bone handled pre WWII American made knives in my collection; but as I continued to buy these wire jacks, my collection grew. One time at the Springfield knife show I had a table next to a gentleman who told me he designed a perfect knife that had the fewest possible parts. He showed me his design of only five different parts and then I showed him one of my wire jacks with only three parts. He was truly amazed! Over time I sold most of my other knives, but I continued to specialize in collecting wire jacks. It was always easy to trade someone a bone handled knife for a couple of old wire jacks, so my collection grew and grew. To this day, most collectors don't seem much interested in wire jacks and some don't even put them on display at shows - as they save their space for more valuable stuff. However, if you ask the folks at the tables, quite a few have one that they can pull out and sell you. Most collectors still don't know a whole lot about them, so I decided to write a little about them to help educate anyone who is interested. I believe that these knives were one of the most ingenious designs ever conceived because of their simplicity and their great functionality. I still carry one with me for every day use. I prefer the pruner blade and the 1926 version because I like the steel in that one better as it is slightly higher in carbon and cuts real well. The earliest patent for a wire handle jack knife was granted to George E. Finkenbiner on October 13, 1914. He filed for the patent on July 8, 1913. The sketch on this patent is similar to the George Schrade 3 & 1/4 inch spear blade without a cap lifter. Another patent was granted to Frank P. Hemming on December 4, 1917. He filed for his patent on July 12, 1917. The sketch on this patent is similar to the George Schrade 4 & 3/4 inch clip blade knife. However, I am not aware that either of these two knives were actually ever manufactured or marketed. Later in 1926, George Schrade also filed for and also received a patent for his version of the wire handled jack knife and these were produced and sold by the millions. George Schrade was born in Williamsport, Pennsylvania, 2/13/1860. He learned the toolmaker and machinist trades. In the mid 1880s he work in a small shop in New York City making mechanical models for the U.S. Patent office, he also had patents on many inventions of his own. George is probably most famous for developing various types of switchblade knives, and there is a lot of information available about them. However, George also invented an improved version of the "Wire Jack" knife and this is the focus of this article. George started the Press Button Knife Co. a Licensed division of Walden Knife Company (1892 - 1923) Walden, NY. In 1904 George left the Walden Knife Co. and started Schrade Cutlery (1904 - 1946), also in Walden, along with his two brothers, Jacob Louis and William. Early knives were contract made in Germany. Sometime later (around 1910) George traveled to Europe, initially trying to find outlets to sell his cutlery machinery. He had some success in England, but by 1913 he ended up in Solingen, Germany where he set up a push-button knife factory. He returned to the US in 1916 due to WWI (after having all of his equipment and supplies confiscated by the German government). George then began working for Challenge Cutlery in Bridgeport, CT. He manufactured the Flylock knife for Challenge at his plant at 46 Seymour Street in Bridgeport. In 1928 Challenge Cutlery went out of business, never making the "Wire Jack" that George patented in 9/21/1926. 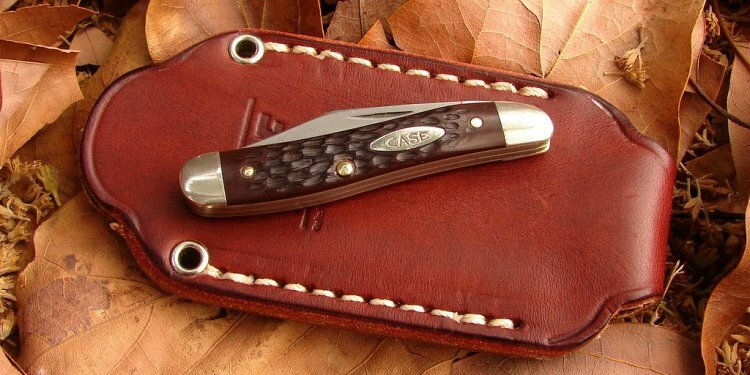 The patent stated, "The object of the invention is to produce a pocket knife of simple construction comprising but two main parts which are economical to manufacture and convenient and efficient in use." In early 1929, George started his own company making "Wire Jacks" at Kossuth Street in Bridgeport, using equipment he got from Challenge Cutlery - in exchange for money they owed him for the rights for the Flylock invention. I now believe that the very first wire jacks were stamped "G. SCHRADE B-PORT CONN PAT. APLD. FOR". These are very rare and I only have ever seen two of them, both have spear blades. Like other small wire jacks, neither of them has the thumbnail opener on the blade.